Beautifully understated without compromising on design, this elegant timepiece from the Diamond Gallery collection by Bulova features a classic stainless steel case and bracelet, offset by a sumptuous mother of pearl dial and sparkling stone set indices and bezel. Made to make every moment glamorous, this opulent watch is sure to steal the show. 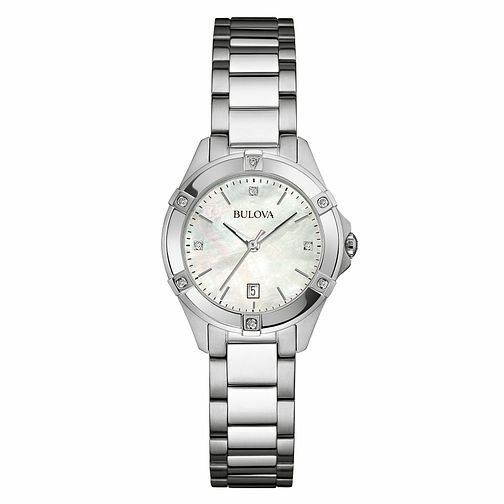 Bulova Diamond Gallery ladies' bracelet watch is rated 5.0 out of 5 by 1. Rated 5 out of 5 by Anonymous from Beautiful watch The watch arrived promptly after ordering online in a lovely presentation box. The watch itself is gorgeous. I already have one and bought this second one as a gift for my sister .